KUALA LUMPUR: There has been an influx of Malaysian buyers for properties in central London in the last two years, driven by the favourable exchange rate and long-term investment appeal, says Savills Inc director James Talbot. 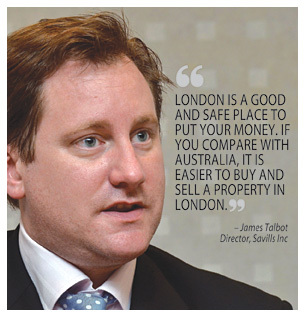 Talbot said more Malaysians are buying properties in London to spread their investment risk. "There is also the feel-good factor of owning a property in central London, being an international financial district," he said in an interview recently. Talbot said property prices in central London have appreciated by 13 per cent over the last three years and are forecasted by Savills Research to grow by 6 per cent per year over the next five years. Rental yields have also increased from 3 per cent five years ago to about 5 per cent, he said. "London is a good and safe place to put your money. If you compare with Australia, it is easier to buy and sell a property in London. "For Australia, as a foreigner, you can only buy properties that are under construction and sell to an Australian and pay tax on profits. There is no such ruling in the UK," Talbot said. Savills, a global real estate service provider with over 200 offices and associates around the world, is introducing a new project in central London called Caro Point to Malaysian investors. Caro Point offers 84 apartment units, priced between STG355,000 (RM1.7 million) and STG11 million (RM55 million). Talbot said 26 units have been sold to investors in the UK and nine in Southeast Asia. The STG100 million Caro Point is part of the Grosvenor Waterside development in central London. Talbot said Savills will continue to introduce new projects in London to Malaysian investors despite the global uncertainties. The group has introduced some 20 projects in Malaysia in the last five years. Damansara Realty Bhd, a Malaysian builder and property developer, rose to its highest level in more than 28 months after The Edge reported that its parent Johor Corp may transfer property projects to the company. The stock gained 6.7 percent to 88 sen at 9:16 a.m. local time in Kuala Lumpur trading, set for the highest close since June 16, 2009. KUALA LUMPUR: iProperty Group bagged the "Digital Media Company of the Year" award in the Property and Real Estate in Malaysia category and "GoHome.com as Property Portal of the Year 2011" in Hong Kong. Group chief executive officer Shaun Di Gregario said the fact that the group garnered the respect of the industry was proof that iProperty Group was the clear market leader in a highly competitive property arena. "Our mission is to continue to deliver first-class customer service and highly innovative products that will create a more engaging experience for property buyers and investors, helping them make a more informed decision," he said in a statement. This was the third time iProperty Malaysia had won this highly coveted award on being recognised as the Digital Media Company of the Year for advertising and marketing. Aside from this prestigious award, iProperty.com Malaysia magazine was also voted the No. 1 magazine for the third year running for advertising and marketing in Malaysia. With the leading market position among consumers and real estate professionals alike, being dubbed as "Property Portal of the Year 2011" further strengthens go.home.com.hk leadership position in Hong Kong. "The accreditation of this award is recognition of the great work that go.home.com.hk team has done over the recent times," Di Gregario added.